This monumental, comprehensive, controversial study is the first volume of a definitive history of the churches in Germany between the wars. 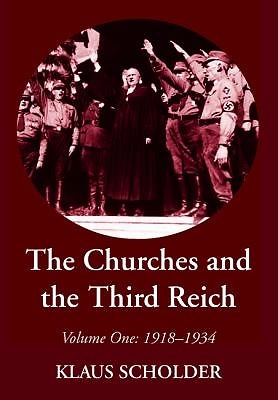 It is especially significant in that it is based on a great deal of original research into both religious and political sources, and is the first book to work on the presupposition that an accurate picture of the churches in the Third Reich demands that both Protestant and Roman Catholic churches are studied side by side, since it was the rivalry between the churches that in some ways contributed to their downfall. Contrary to what has often been asserted, Professor Scholder argues that Hitler did have a plan for the churches over a long period. Crucial to that plan on the Catholic side was his desire for a concordat parallel to that achieved by Mussolini, keeping the clergy out of politics, which the Vatican was over-hasty to meet; it was the attempt to treat the Protestant churches in a similar way to the Catholic church, which led to the difficulties that ended in the church struggle. There is also a realistic analysis of the Jewish question, documenting the churches' failure in this area with severity and scholarly rigor. The first part covers developments up to Hitler's seizure of power; the second is devoted to the year 1933, during which all the major issues were in fact decided. ""This is a magnificent work of historical writing that reads in places like a novel. Yet one cannot peruse it without a feeling of immense sadness. . . . The scar of the Nazi epoch with the Holocaust it created still stands as the great moral catastrophe of our century. How did it happen? Professor Scholder has cast considerable and very uncomfortable light on this vexing question. To read him, as a Christian, is to be sobered and humbled."" --Harvey Cox, The Divinity School, Harvard University Klaus Scholder, who died prematurely in 1985, was Professor of Modern Church History in the Evangelical Theological Faculty at the University of Tubingen and Vice-Chairman of the German Evangelical Church's commission for contemporary history.